This post expands on ideas I shared, in a series of tweets, with John Finlayson (@MrFinobi) about ‘learning objectives’. Learning objectives can be a powerful tool in a teacher’s toolkit. At the same time they can be a teacher’s Achilles heel, either tied in with a rigid lesson structure that has been forced upon them or (as I see too often) misunderstood for being a statement of what is going to be produced rather than what is going to be learned. His contention is that learning objectives are an integral part of effective AfL strategy. He argues that sharing of learning objectives opens up a discourse about learning. (Wiliam, 2010) I am inclined to agree and would recommend that all teachers experiment with the way they share learning objectives. One of the most effective ways to ensure that you are using learning objectives effectively with your students is to consider the work of Shirley Clarke. In her book ‘Formative Assessment in the Secondary Classroom’, Clarke explores the value of learning objectives in significant detail. She discusses the ‘taught specifics’ inherent within learning objectives arguing that teachers need to “move away from “PRODUCT” oriented success criteria to “PROCESS” oriented success criteria” (2005, 30-31). She goes on to argue that if used correctly, process success criteria can set the agenda for the learning and also provide a specific focus for peer and self-assessment activities. Having built Clarke’s approach into my lessons for some time now, I have seen significant improvement in the way my students approach their learning – confident in discussing what they are learning, why they are learning it, and how they will succeed in doing so. Clarke also suggests that students should write learning objectives down. This I disagree with. I do not feel it is necessary for students to write down the learning objectives during every lesson. Nor, do I believe that a teacher needs to put the learning objectives on the board during every lesson. Depending on what is to be learned I take a variety of approaches to introducing the learning objectives. Sometimes, I put the success criteria on the board and then ask students to discuss what they think the learning objective is going to be. Other times, I only put the learning objective on the board and ask the students to decide on what the success criteria will be. This is an important step in developing the discourse about learning that Wiliam refers to. David Didau (@LearningSpy) in a recent blog post discussed the value of ‘discovery learning’, where the teacher does not begin with an objective or question but creates a sense of engagement and curiosity through modelling and student interaction. So how about trying this? Stride purposefully into the room and, without a word, begin drawing a face on the board. Draw an arrow next to the head and write, “Head like an egg”. Turn to the class to see the reaction. Offer them the pen. Don’t worry if they don’t get it yet, continue by labelling the eye with, “Eye like a crater”. Sooner or later they will begin to join in and end up sputtering with delighted laughter at all the hilarious comparisons they make. How much better is this than waltzing in with the question, “So, can anyone tell me what a simile is?” Anyone inclined to dismiss discovery learning as nonsense need look no further. The power of students discovering for themselves the point of a simile (or apostrophe, or subordinate clause or whatever) is much more likely to be memorable than their teacher just telling them. This same approach can be applied to learning objectives. Like many good teachers I do not only spend time discussing where the learning is going but also build in time to reflect on the learning. It can be, again depending on the context, to not reveal the learning objective until the end of the lesson. Allow the students to muddle their way through – it can often be quite liberating and lead to unexpected learning outcomes alongside the ones you intended. John’s original tweet asked me if I ‘differentiated’ learning objectives. My response was an unequivocal ‘No’. The reason for this is because I subscribe to an ‘incremental view’ rather than a ‘entity view’ of intelligence and learning (Dweck, 1999). A student’s learning potential is not pre-determined. Both the least and most able students in my classroom have the potential to progress and they need to learn to utilise the same skills in order to pass their exams. As such I feel it is wrong to differentiate objectives by skill or outcome. The box provided (on my school’s lesson planning sheet) for entering learning objectives is broken down into the following sections: ‘All, Most, Some’. I know this has been set out this way as it is something that Ofsted like to see. However, I am not convinced by it, having never seen the research behind it. I have seen lesson plans dutifully filled in, explaining how different sets of students will learn different skills. Last time I checked, every single one of my students was capable of learning to do all of those skills, if taught the right way. Last time I checked some students found evaluating easier than analysing. Whichever taxonomy you prescribe to (Bloom’s / SOLO), the skills listed do not exist within a hierarchy or on a continuum. They are not linear. Learning is messy. Based on my experiences over the last nine years, learners will acquire different skills at varying rates in varying orders of preference, based on a diverse range of factors. None of this is to say that I don’t believe in differentiation. I do. In my mind, differentiation is not about learning objectives or outcomes, it is about teaching and learning. Differentiation takes place during the lesson. It is present in the way I formulate groups for discussion and projects. It is present in who I choose to spend my time with during a lesson and what I do with them. It is in how I deploy my learning assistant. It is about focussed differentiation; targeted support; the development of independent learning skills. I believe that in a classroom learning objectives should be shared; every student working towards similar goals but in different ways and at different speeds. The learning objectives set the direction of the learning. How the map (success criteria) is formulated however is sometimes up to me and sometimes up to them. Sometimes, we lose the map and get lost along the way. Together, through communication and sharing, we find our way back. And, sometimes there is no map; we get lost on purpose, excited to see where we might end up. Clarke, S. (2005) Formative Assessment in the Secondary Classroom, London: Hodder Murray. Dweck, C. S. (1999) Self-Theories: Their role in motivation, personality, and development, Philadelphia, PA: The Psychology Press. Very interesting James – definitely a few points for me to consider here. Thanks David, I have seen the ‘Interesting Ways’ piece before… it is certainly helpful in considering approaches to introducing learning objectives. Your ‘Continuum Model’ looks great. Differentiating the success criteria is something I definitely believe in. It is one of the ways that I teach students to write effective analytical paragraphs. This is different to what I was driving at when I said that I didn’t differentiate learning objectives. The objective is the same however the outcomes will certainly be differentiated. What I like about this approach (and I’m sure you’ll agree) is that it is non-limiting. Any student in the lesson has the potential to achieve an A grade. They are aware of the success criteria and as it is presented in stages, they can continue their ‘learning journey’ improving their work either in response to the criteria or to feedback given during/after the lesson. Exactly! The idea is that everyone can access the L/O at different points, all travel in the same direction and all have the opportunity at making it ‘all the way’ rather than opting out at ‘some’. Also, what about: A* – I can evaluate the writer’s intentions? Your concept of zooming in and out actually answers my question for me. Some students I have found grasp the big picture quickly… they can make inferences and hypothesise. However, they find close analysis of language for example more difficult. Others react in the opposite way. They are fine grappling with small pieces of text, interpreting and analysing, but struggle to see the big picture. Students who become more skilled in close analysis will usually become more effective evaluators but I don’t believe the two skills are always mutually inclusive. Great post. I also don’t think that having objectives on the board has much benefit to anyone. Surely if the lesson is effective, the objective should be clear to the pupils anyway? The best way I’ve heard this described is that the lesson aim should be like the wording in some seaside rock – clear and available the whole way through the lesson. Nice analogy Stephen… succinctly extends the point I was driving at. I work in an engineering discipline, and many people seem to find it very hard to zoom out and see the bigger picture. Personally, I find I can’t understand the detail without zooming out, and seeing the bigger patterns, and I find that most of the critical thinking occurs at this sort of level. The reductionist approach in engineering, breaking a problem down until you can solve the small parts, is all well and good but I find people miss opportunities to solve other problems at the same time, or come up with solutions which deal with such a small part of the whole that they are less than completely useful. In fact I think the ‘reductionist’ approach you talk of Pat is counterintuitive. In teaching Media Studies we often analyse a text on both the macro (representational) and micro (technical) level. The macro analysis always comes first as it centres around perception. Whereas, the micro analysis is useful in underpinning conclusions drawn at the macro level but certainly not as useful when engaged with inside a microcosm. You may be able to discuss the cinematography in terms and structure but to form meaningful analysis it needs to be considered with the wider-macro-context. Engaging and informative responses. The lesson objective presented in the arrow makes complete sense. Suitable for the students and will perhaps convince the powers that be at my school that there is an alternative to the ‘all, most, some’ approach. Thanks for sharing, adds further weight to my arguments. Thanks. You’re welcome Gareth, I hope that you are successful. I gave up on Learning Objectives about 2 years ago. I had spent almost 9 years teaching in Gran Canaria where writing the LO on the board hadn’t entered the vernacular yet learners continued to learn at varied paces throughout the year. Once I returned to the UK 3 years ago I spent one year at one school which insisted on the written LO on the board. I did so to appease the SMT but questioned its use every chance I got. On every occasion the answer was the same, Ofsted expects it. That told me an awful lot about the state of education in this country today. For some reason schools are not providing an education to enhance learning but one that appeases the rigours of an Ofsted inspection. This is entirely wrong yet it continues to infect teaching and learning today, teachers have become so indoctrinated with writing an LO on the board before a lesson that it makes me cringe. However, playing this Ofsted learning game doesn’t have to be so restrictive. As you point out in this inspiring post, teachers do have other ways to satisfy SMT/Ofsted yet also give power to the teacher to teach and the learners to learn at their own pace. It is the indoctrination that concerns me too. The underlying discourse of “this is how we do it because that is what Ofsted want to see” is inherently wrong. Having been through a HMI visit and two Ofsted inspections I can categorically state that this is not what Ofsted want to see. A lesson can be outstanding with the LOs being written on the board, in the same way that a lesson can be outstanding without five mini-plenaries. Ofsted want to see learning happening in the classroom. They want to see children progressing in their learning. Following a strict lesson structure (LOs included) is not a guarantee to even a satisfactory lesson, let alone an outstanding one. We need to experiment with, reflect on, and evaluate a variety of strategies and approaches to engaging students in a discourse about their learning. Find what works and build on it. If that includes sharing LOs on the board at the start of your lessons then that is fantastic, but we must not restrict their lessons to uninspired conformity. Our students, simply, will not thank us for it. – There’s a tendency to see the routine use of LIs as uncreative, mechanical, lacking in creativity, and I think most teachers would agree that there’s no need for all to use them in the same way, or for LIs to be communicated in a particular form in every lesson. However, it’s worth noting that where LIs are routinely not made explicit, a likely outcome is that students from environments which are more culturally predisposed to success in our current education system will continue to do well and make reasonable progress, whilst students who are not, will suffer. Essentially, I think that it’s worth being more routine and explicit with learning intentions than we think we might need to be; it’s so easy to assume that the students understand what’s being learnt, when in reality it’s much easier for some groups of students to intuitively grasp what’s going on than it is for others – there’s an important issue of social justice at play here. – Very interested in the ways that people are using success criteria, and we put a lot of time into this at my last school. The driver for us, funnily enough, was the introduction of APP in English. This provided such a crystal clear model of everything that we would not want our assessment system to be that it proved useful in stimulating our thinking – if we didn’t want to do APP, how were we going to work with assessment to get to a much purer form of AFL in English? We ended up ‘crunching’ APP – getting the 8 AFs for writing down to 4 (on the basis that, for example, sentence structure and punctuation are so inter-related that they really don’t need to be addressed and assessed separately), and crunching vertically also, turning the 8 levels in the descriptors into just two. The language we used, whenever we wanted to share criteria with students, was to describe the qualities of ‘Skilled’ work, meaning getting the basics right, and focusing on accuracy, clarity, relevance to task etc – I suppose these would be our ‘process’ success criteria. On top of this though, was the ‘exploring excellence’ criteria, which attempted to describe some of the qualities which students might aim for in order to explore (rather than ‘achieve’) excellence – things like ‘increasing sophistication / precision / detail / originality etc). These were qualitative success criteria and a powerful tool – by providing criteria which could only be explored rather than achieved, it resulted in an open-ended, exploratory experience, characterised by high levels of student autonomy, choice and self-reflection. It also recognises the ‘messiness’ of learning which you’ve mentioned a couple of times and which I agree with, particularly in English. Alongside this, we took the decision, post-SATS, NOT to use Levels in English classrooms in KS3 – we did record and report to parents 3 times per year, and if kids wanted to know we’d tell them, but apart from that, levels were never referred to. This made me a bit nervous as HOD when OFSTED did come in, but they were full of praise and assessment in English was picked out as a key strength – having said that I think we were lucky to get a reasonably enlightened inspector. Would still love to come down and have a proper look at your Media stuff – maybe a visit in the summer? I agree, there is a place for routine in learning and the use of LOs. As I said in response to Kevin above, if a teacher finds that sharing them in a particular way, at a particular point works for them in creating an effective learning ethos in their classroom, then this should be encouraged. But as you imply, there is more than one way to share them. And that’s the point. This is not about not sharing learning objectives. It is about not playing lip-service to sharing them simply to tick a box. LOs have purpose, they are part of a wider AfL strategy NOT just a bullet on a list of ‘successful lesson criteria’. I like the way that you have approached success criteria. In my view, SC are the most important aspect of sharing LOs. 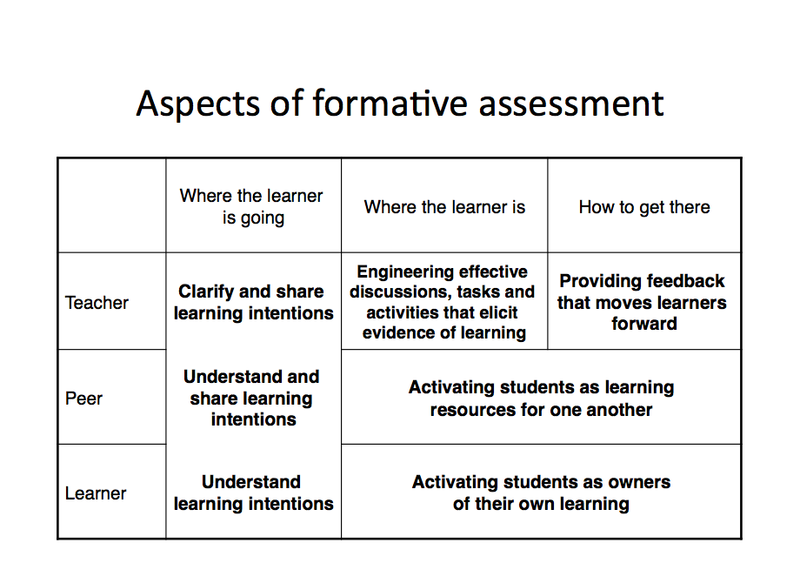 If used correctly they provide a framework for effective formative assessment – particularly when trying to develop meaningful peer/self assessment with your students. I am also, particularly, impressed with your commitment to AfL by removing levels at KS3. I think this is something we should be doing here at CCC but I’m not sure how it would go over. As a number of us have completed MA modules in AfL, I do think we have the expertise to affect such a change however, I think there would be significant resistance from SLT. I would be more than happy for you to come in and visit. Lots of exciting work happening in the Media department at the moment. Particularly with production work, independent learning strategies and the teaching of ‘Postmodern Media’ at A2 level. Check out the blog to see what we have been doing. Student production blogs are in the sidebar on the right. Hi Stuart, thanks for sharing your post with me. I agree that we shouldn’t use LOs in a didactic way, nor should we be aiming to please Ofsted. However, I don’t believe that this is either/or. I think that LOs are valuable for both learner and teacher. Where and when they are shared however is a different matter. As I indicated in my post, I believe it is about variety – creating a range of scenarios that empower learners to take ownership of their learning. Moreover, having a defined LO, does not in my view give away the ending or set a firm outcome. It is merely a suggestion. Limits can only come from the teacher themselves. The teacher who believes that their lesson plan must be stuck to rigidly, who believes that there is only one outcome – they are the limitation themselves. Many excellent teachers set out with a clearly defined LO but they are not rigid, they have the skills and ability to adapt, to weave learning, to allow organics to happen in the classroom, allowing learner to lead and thrive. Besides, it’s useful to have something to aim at, doesn’t it?